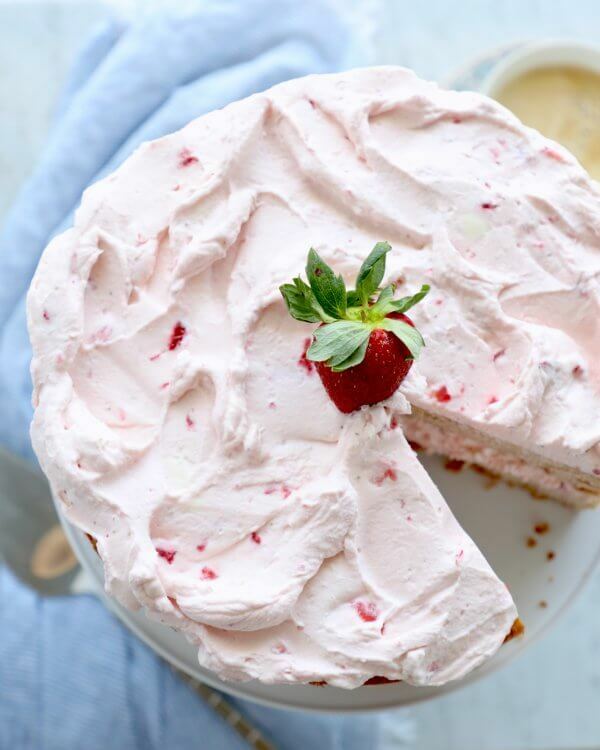 This beautiful and tasty Keto Strawberry Mousse Cake is going to make all of your spring-loving Keto dessert dreams come true! Easy to make and a feast for the eyes, with minimal fuss and no fancy decorating skills required! 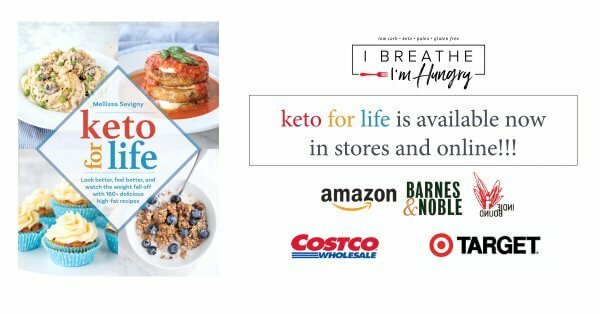 Strawberry season is in full swing, and since strawberries in moderation are Keto-friendly, I love to include them in my keto dessert recipes whenever possible! 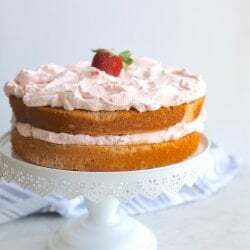 While scrolling though past IBIH strawberry recipes for inspiration, I found strawberry cheesecake, strawberry jello salad and, strawberry icebox pie – but there was a huge gap where a strawberry flavored cake and frosting obviously needed to be. 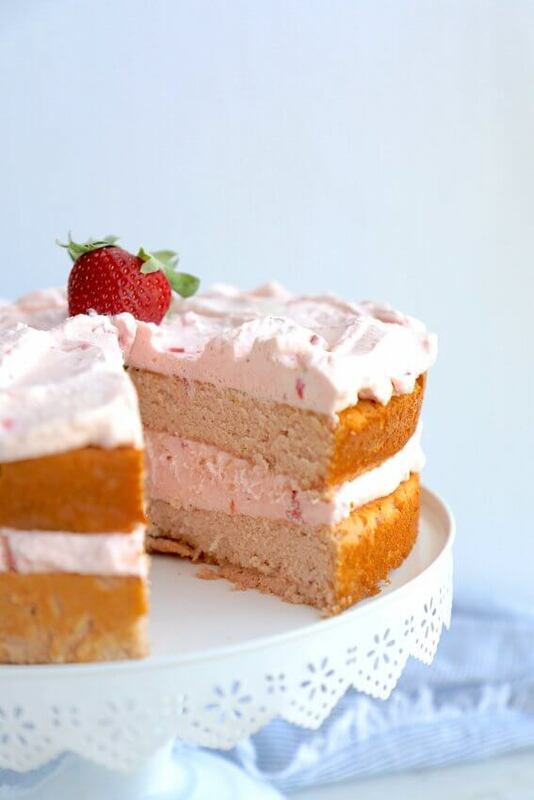 And so, I give you this Keto Strawberry Mousse Cake! 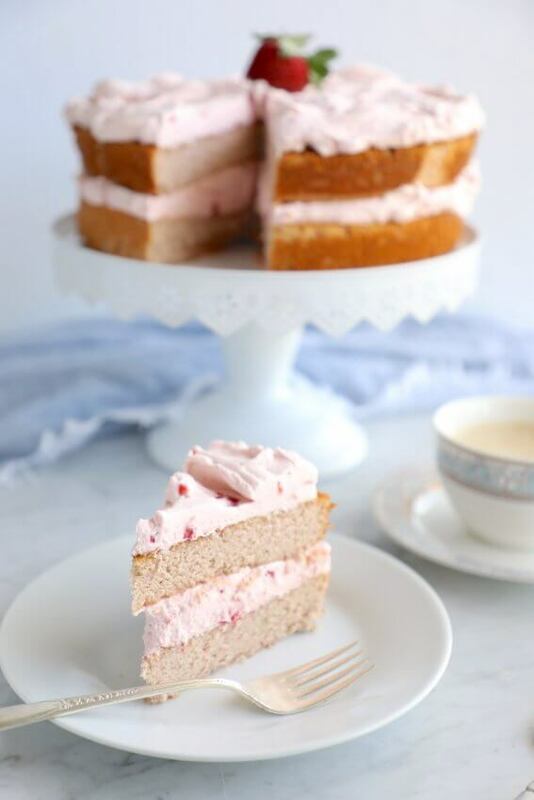 Not overly sweet, but with a noticeable strawberry flavor in both the cake and mousse, this Keto Strawberry Mousse Cake is the quintessential spring dessert! While I opted to keep this look casual, simply spreading the mousse out on both layers and keeping the sides “naked,” if you’re serving this Keto Strawberry Mousse Cake for a more formal occasion you could absolutely frost the sides as well, and use a star tube to pipe rosettes on top for a more finished look. 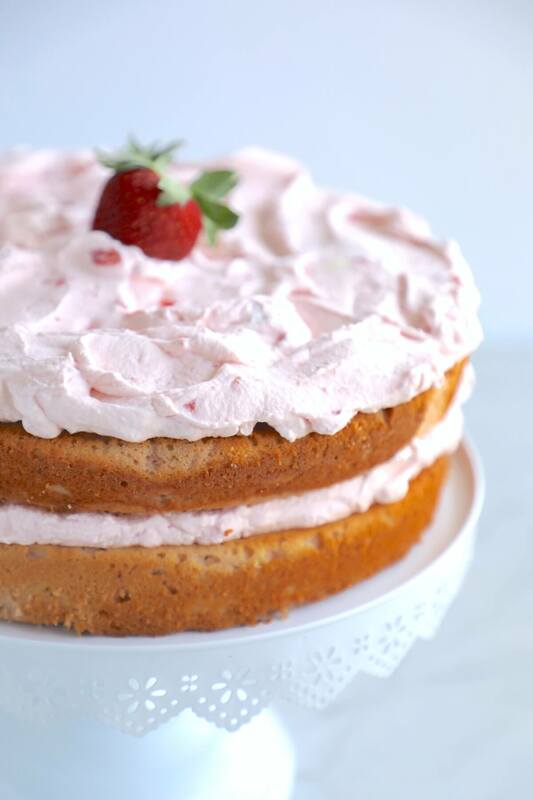 If you have room in your refrigerator I recommend making and assembling this Keto Strawberry Mousse Cake the day before you plan to serve it, because it tastes even better after a night of chilling! I used Great Lakes Gelatin to stabilize the mousse, but it’s not strictly necessary – the mousse will just be slightly looser without it. If using a stronger gelatin like Knox, I recommend just 1/2 teaspoon so it doesn’t get too firm. 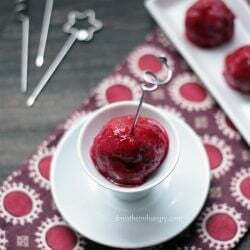 To boost the strawberry flavor, without extra carbs, I used a small amount of strawberry extract, which you can find in the baking aisle of larger grocery stores, or on Amazon. If you don’t have a large, high powered blender like mine, you may want to make the cake layers with a mixer instead. It shouldn’t affect your results either way, just blend it for several minutes until fully combined and relatively smooth. As always, when baking with almond flour it’s important to use a blanched (skins removed) and super finely ground almond flour (my preference) to get the best results and texture in the final product. 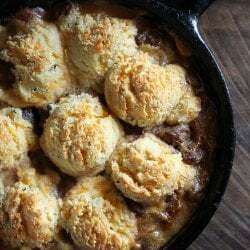 I also used Swerve granulated and powdered erythritol in this recipe, which bulks it up and helps the texture in addition to providing sweetness. If you opt to go with a different sweetener like Sucralose or stevia (especially in liquid form) you may not get the same results as I did. Because this is a tall and very rich cake, I’m entering it in for 16 servings/slices, which is plenty, I promise you. 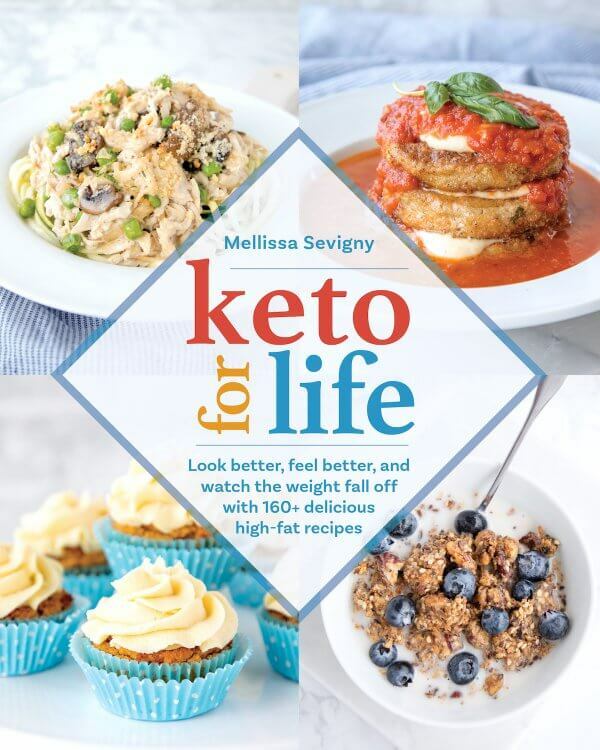 But if you like a bigger piece of cake, here is the nutrition info for 1/12th of the cake: 562 calories, 49g fat, 14g carbs, 7g fiber, 7g net carbs, 12g protein. 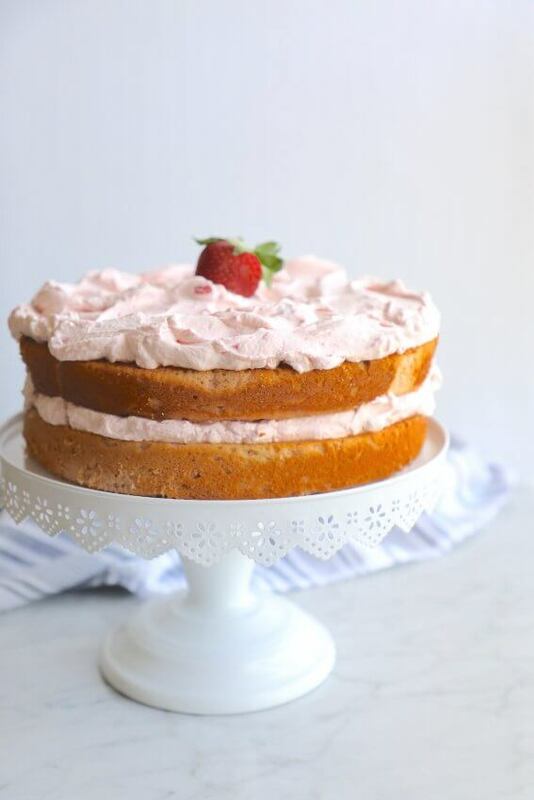 This Keto Strawberry Mousse Cake will make all of your spring dessert dreams come true! 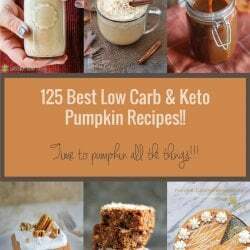 Low carb and gluten free. Grease two 9-inch cake pans and line with parchment paper rounds for best results. Combine all of the cake ingredients in a large blender. Blend until mostly smooth. Batter will be thick and may require scraping down the sides of the blender with a spatula for complete mixing. Divide the batter between the two cake pans and spread smooth. Bake for 40 minutes, or until a toothpick inserted in the center comes out mostly clean. Remove from the oven and cool for 30 minutes. Carefully turn cakes out onto a wire rack and cool an additional hour before frosting. Combine the heavy whipping cream, erythritol, vanilla, food coloring (if using) and gelatin in a large mixing bowl. Beat well with a whisk or mixer, until stiff peaks form. Carefully fold in the softened mascarpone cheese, strawberry puree, and chopped strawberries until well blended. 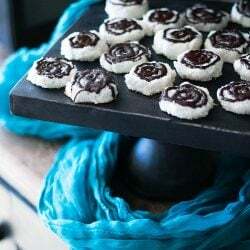 Place a cake layer upside down on a serving platter or cake plate. Spoon 1/2 the strawberry mousse onto the top and spread to the edges. Top with the 2nd cake layer and press down slightly. Spoon the remaining strawberry mousse onto the top and spread to the edges. Store leftovers in a covered container in the refrigerator for up to 5 days, or in the freezer for up to 3 months. 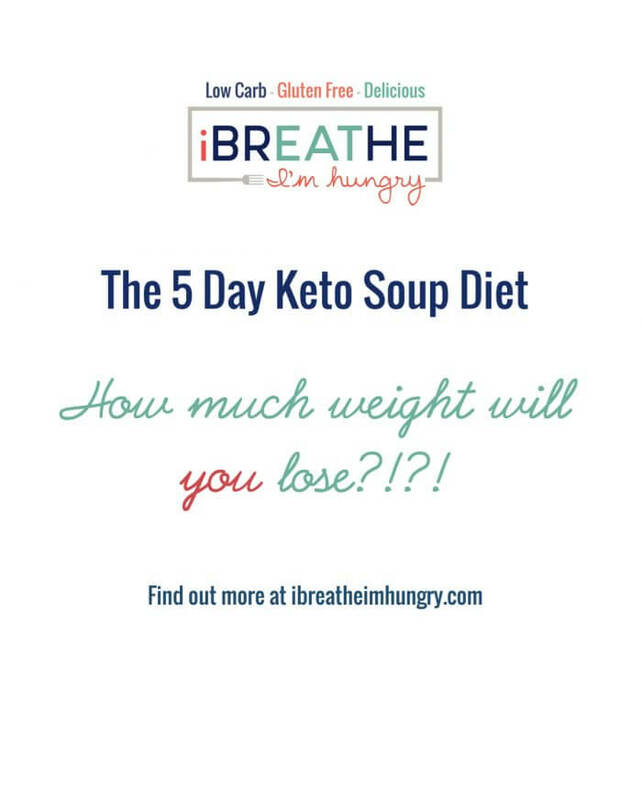 Approximate net carbs per serving = 5g. This cake is ridiculously good. I mean, insanely good. So easy too. I served it for Easter dessert along with a regular non keto cheesecake. Everyone raved about this cake-said it was much better than the cheesecake. 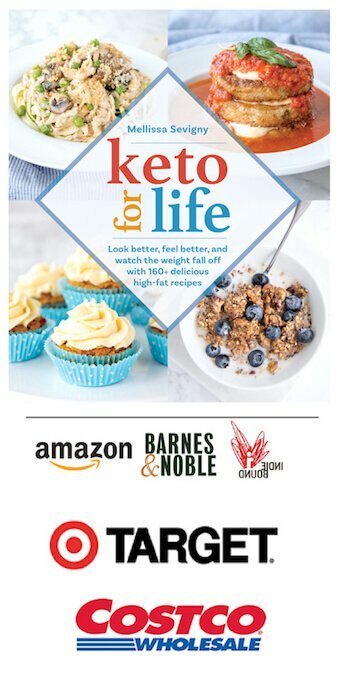 Even the people who aren’t doing keto loved it. My husband, who isn’t a huge dessert fan, had two huge slices. Did I mention that this cake is good?? Can I give it more that 5 stars? Just made this. It didn’t rise at all and was very dense. Still tastes good but just didn’t rise. Maybe it is my baking powder? I will definitely be trying it again. This cake wouldn’t rise as much as a traditional cake but it should rise and puff a bit for sure. If your baking powder is more than 6 months old it’s possible that it lost it’s pep. Also if you’re not using a super finely ground and blanched (skins off) almond flour you’ll end up with a much denser cake that won’t rise. WHAT on Earth did I do wrong?? I measured everything for the cake. Did not deviate at all. Did not add food coloring. I have been cooking the FIRST layer now for 60 minutes. Had to cover top at the 35 minutes to prevent it from over browning. THE inside of the cake is like a mushy pudding. IF I had removed it at 40 minutes it would have poured from the pan with an outer crust. Please tell me where I went wrong. Really hard to say – sounds like too much liquid but not sure where since I wasn’t there. If you’re using extra large eggs, not superfine blanched almond flour, or made an error with measuring maybe, but what your describing definitely shouldn’t happen if the recipe was followed exactly? Also, this calls for 1 cup of strawberries, pureed – did you use one cup of strawberry puree? Because 1 cup of strawberries, pureed after the fact will yield only about 1/2 cup of puree? Okay! and YES … I used one cup of strawberry puree … not one cup of strawberries pureed. Let me tell you. Besides being extra extra moist. After cooking each layer for over 75 minutes each; too the point that it was firming up; definitely not dry; lol. I continued on. I cooled completely and dressed out with the mousse. After supper I served the first piece to my husband. He said it was outstanding … fantastic flavor. It ended up with the density and texture of very moist, heavy banana bread. It is still quite delicious. This cake does not even need covered. It is now 3 days old and still moist. LOL … we have been snacking on it for the last 3 days. Today will most likely be the last day as it is almost gone. THANK you very much for the explanation. Now I must decide whether to do it correctly next time … or continue on with this delicious mistake. Thanks for all you do Melissa. 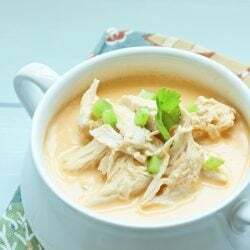 I love all your recipes and thank you for your wonderful website. First time I have ever stuck to a diet for more than 6 weeks! 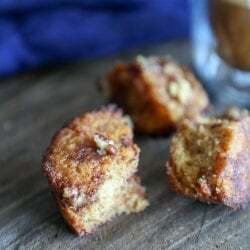 I have a question about the coconut flour, I am not a fan, at all of coconut. Can I delete this and sub more almond flour instead? Same for other recipes you have. Sorry Cindy, I don’t recommend messing with the flours in this cake, or you may find it’s a dense, mushy, mess. The coconut flour is very absorbent and adds a textural element that results in a more authentic cake texture. 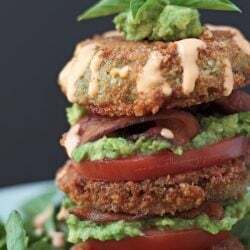 If you simply replace it with more almond flour I can’t say how much it would take, or guarantee that it will produce a good result. 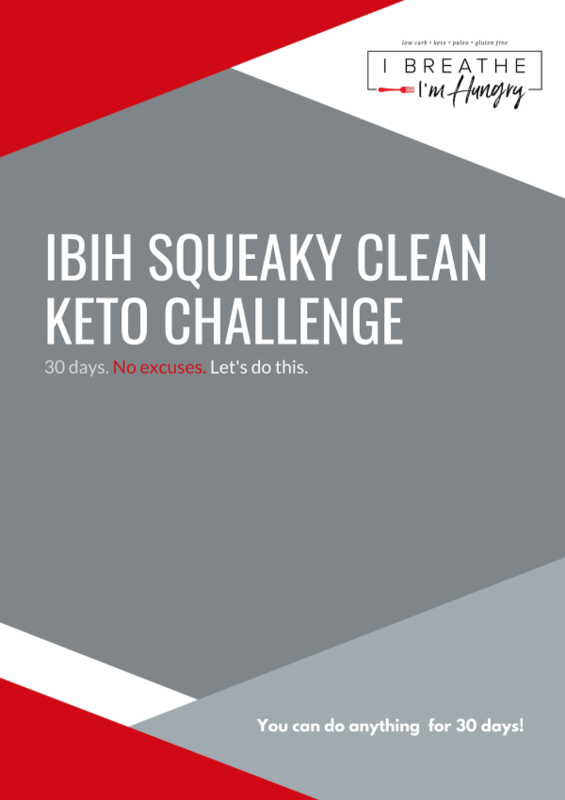 However if you do experiment and find a way to make it work, please post your results for others who may have a coconut allergy and need to make the same substitutions. Thanks! My daughter & I had a baking day & this was 1 of the recipes we decided to try. While I usually don’t modify the original recipe until I’ve made it once, I did add 1 ingredient that took this from a good cake to an AWESOME cake. We both thought there was a lot of flour in this cake & thought it might tend to be on the dry side. We didnt modify the amount of flour, but we added a half a cup of sour cream, which actually turned this into a 3 layer cake. I have to say that the addition of the sour cream was a very good decision. Cutting this cake is like cutting soft butter. Took it to a whole new dimension! Was/is an OUTSTANDING cake! Thank you for the recipe! 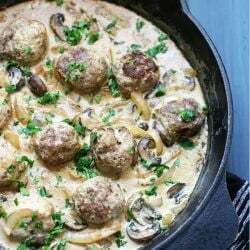 It will be 1 of my favorites to make! Sounds amazing Anna, so glad it was a hit!